Using fNIRS opens doors and provides new opportunities for studying brain activity that was not previously possible. Autism spectrum disorder, or ASD, is a complex developmental disability; signs typically appear during early childhood and affect the ability to communicate and interact with others. There is no known single cause of autism, but increased awareness and early diagnosis and intervention lead to significantly improved outcomes. Techniques such as functional magnetic resonance imaging, or fMRI, have revolutionised neuroscience by allowing investigators to map differences in brain activity associated with neuropsychiatric disorders such as autism. However, fMRI requires participants to lie still inside an MRI scanner. This limits the kinds of activities people can undertake during an MRI, and some participants will also find it difficult to tolerate. Our Lenroot research team has introduced a recently developed technique called Functional Near-Infrared Spectroscopy, or fNIRS. This measures brain activity using light giving researchers a new way of studying brain activity in real-world settings. Very low frequency, or near-infrared, light is projected from special optodes, like miniature flashlights, that are set in a cap similar to that used in an EEG. The light goes through the skin, muscle, and skull and into the outermost layers of the brain. While much of this light is absorbed, some is reflected back outside the head where it can be detected and measured by special sensors. The amount of reflected light varies with the level of activity of different brain areas; measuring this variation in the reflected light provides a way to map brain activity. 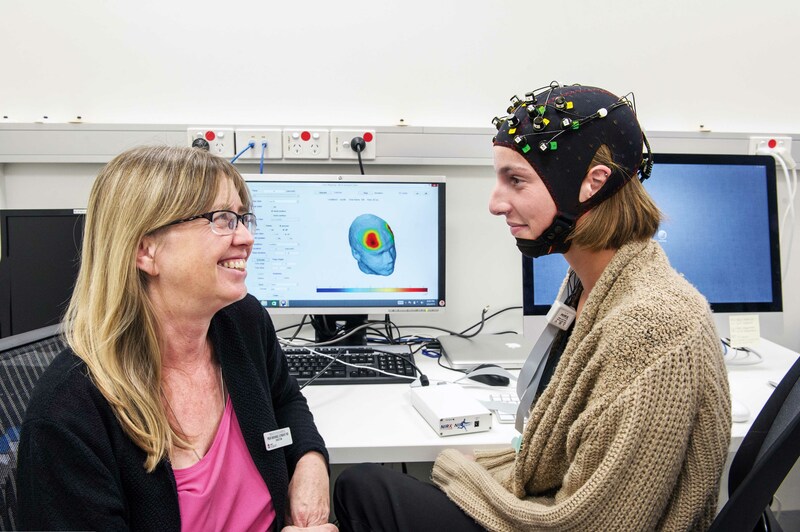 The first project we are undertaking is to study any significant effects on brain activity of an intensive early intervention program for toddlers with autism.